Dreamt of spending time with nomads for a long time. To experience their minimalistic lives, to observe the mental strength with which they embraced the harshness of nature, to learn from their solitary non-community based living, to understand the near-absence of the need to possess material things, to keep moving tirelessly to unfamiliar new places out of their comfort zone…. An attempt last year to go to visit the nomads in eastern Tibet near Xining was a failure. 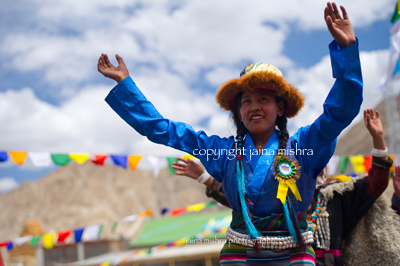 This September when I boarded the plane for Leh, I came looking to experience the beautiful culture of Ladakh – the dances, the costumes, their traditions and the mentality of the people of the Ladakh valley, the Nubra valley and the Zanskaar valley. 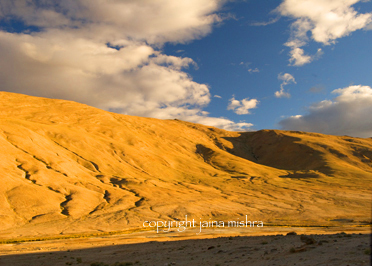 But I did not expect to experience the life of the nomads of the Changthang – a desert region of Western Tibet that extends culturally beyond the political India-China border into Ladakh, India. 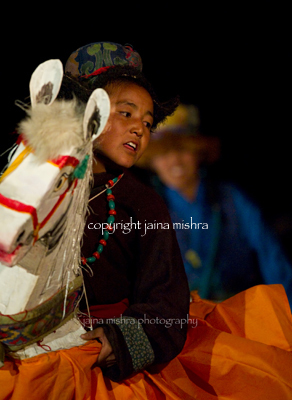 During the magnificent Ladakh festival, I watched the children of nomads perform on 2 days. This was their very first performance before an audience – they had never performed before this, even within the comfort of their own school. 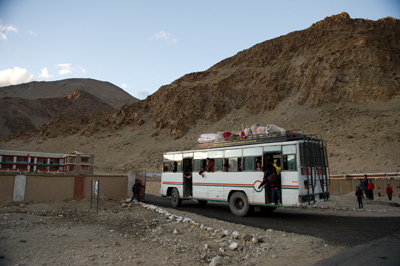 They had come from a school in a remote area in Changhthang 200 km away from Leh (of deep and treacherousHimalayan roads – not a 6 lane highway) and 20 km from the nearest village. Coming from nomadic families that moved constantly, no regular day-schooling was possible – hence a residential school was set up specifically for nomadic children aged 3 – 13. 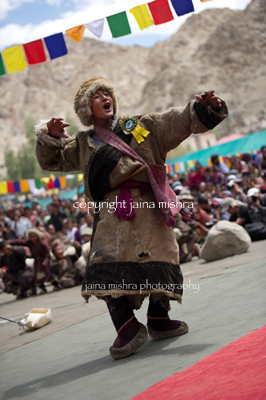 Of all the cultural performances and events presented during the festival by the various folk groups of Ladakh, the most striking one was the one put up by these children, and much more noteworthy because it was their first performance ever. They danced in complete happiness, and their glee and enjoyment was obvious through their eye contact with each other and the communicative smiles they shared amongst themselves. They were having the time of their life as they danced, and as a result, we, the spectators enjoyed the biggest visual feast of the festival. The idea of connecting with these children, struck me as I walked to my car after their final performance was over and everyone had gone home. As the idea grew to obsess me, I realized that I had to act quickly otherwise I would lose the already slim chance of establishing contact. 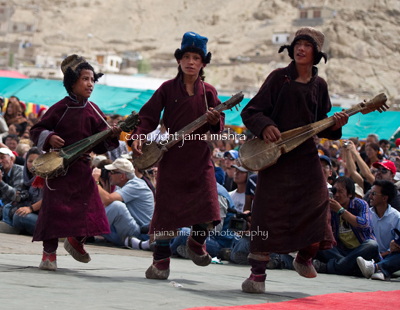 It occurred to me that some lodging and boarding arrangements for this group (0f 50 kids) must have been made somewhere in Leh, and since the evening’s performance had ended at 8pm, my guess was that they would spend at least that night in Leh. So my driver was given the assignment of finding out where these kids were housed. And the resourceful man that he was, the next morning he had the answer! At that point, I had no clarity of what I wanted out of this connection and hence no proposal or Plan A and Plan B, as taught to me at management school. I was going in completely blank and letting destiny unfold. So at an appropriate time, under the guidance of my driver, I presented myself at the government building in which they were housed, sought out the adult organisers – the teachers – and attempted to articulate my interest. Am not sure whether my jumbled and excited expressions of my interest in culture, of my fascination of the nomadic lifestyle, of my naration of the un-forgettable experience with Kutchi nomads, my account of the failed visit to Tibetan nomads, my testimonials of awe of their textiles and jewelry, or my brief verbal biodata past work with the working on developmental skills of children made any sense to the teacher …but maybe my excitement at being able to interact with these beautiful little people did get conveyed effectively to him. Or maybe it was just his kind and generous nature that eventually let me have my way. I went and sat with the kids who had gathered in the hall. We chatted open heartedly. They talked about themselves. I talked about me. As I praised their dances, they got up, pulled me up and began teaching me the steps and we all danced around in a circle – them with natural grace and rhythm and me clumsily trying to follow their steps and their spirits. 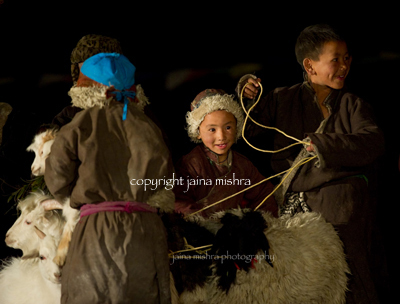 I learnt that each had flocks of sheep or goats or yaks that numbered in hundreds. I asked what would happen if one gets lost – how do they track these animals. They replied almost in one voice, that if a sheep gets lost, it bleats and cries until it is re-united with the flock. As we sat on the floor in the dim light of a single 40 watt bulb, they told me of the wolves and the snow leopards they had seen. And of the 4 months of severe winter (-30 degrees C) they face. That most had not seen vegetables until they came to school, and how one of them cried when he was asked to eat a banana. The 13 year olds knew how to milk their goats and shear the wool off the sheep (I do not even have the right vocabulary for these activities!) and light fires using wood and call out to their flock with mere whistles. They know how to set up tents and how to assist in childbirths. Instead of quenching my fascination, this chit-chat was leading to an explosion of awe, as I was getting more and more attracted by their lives. Again, it took a brief moment to stop and realize that I could not let the interaction end here, and that I would have to push my way into their life some more. And so I went back to chat with the teacher. Over tea and biscuits, I said that I would like to visit the kids at the school. This request was unusual so he tried to understand it better and over the next half an hour I animatedly expressed my desire. Finally we agreed that I would visit the school the next day, arriving around the same time that the busload of kids would reach back. We agreed that I would spend the night at the school in one of the rooms and he wrote me a note of introduction for the lady teachers who were stationed at the school, since he planned to stay back in Leh and did not intend to return to the school for the next 2 days. And so, the next day, dropping all other plans, I set off for their village, filled with happiness and gratitude. Carrying gifts of chocolates and photograph prints of their performance. 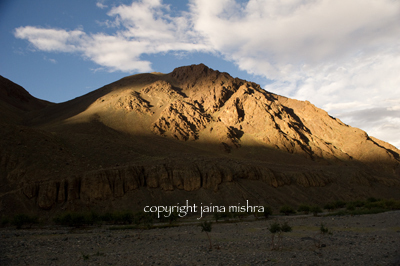 Tashi the resourceful driver, knew his way and after passing through golden landscapes lined by the Indus river, we arrived at the village at 5pm. 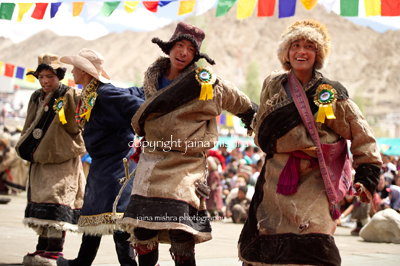 The rest of the children who were not part of the Leh performance, were perched up on the walls of the school compound and on the gate and they greeted us with happy shouts – but it was not us they were waiting for. They were eagerly waiting for the school bus to bring back their friends. Soon enough this bus arrived and the happy reunions consisted of shouts and screams and animated chatter and some wild running about. No teacher was in sight. Not on the bus and not on the premises of the residential school building. The kids got together and unloaded the sacks of food raw material, the stoves, the kerosene, the packages of clothing and other materials used for the performances from the top of the bus, cooperating and collaborating as a single one unit. The oldest child was 13. Only 13. This endearing show of responsibility, this complete self-dependence – this format of no-nanny, no-adult-care-givers (on long distance journeys or within the hostel) – surprised and delighted me. It made me realize that in the urban world we place too much importance on our own roles as parents. Here I saw perfectly responsible kids who needed no one to tell them what to do or not do. They simply knew. And they did what was required without any direction from some authority above. The cook who had gone with the bus, found the lady teachers who lived in a separate building. I showed them my note of introduction. 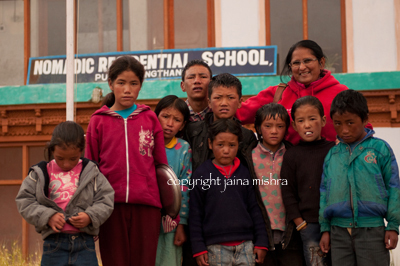 After very hospitable chit chat, they took me to the school staff room that would be my sleeping room for the night. A mattress and a lamp were brought in and I was shown the Ladakhi toilets (this is a quaint eco-friendly system that I will describe later) that were in a different section of the building. Over tea and chit chat, a whole group gathered around us as we sat on the floor. 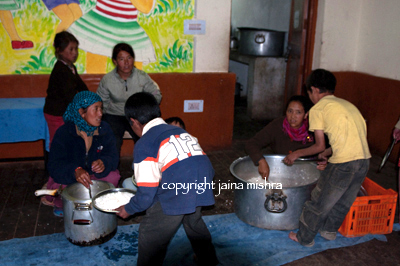 Cooks, assistants and other teachers heard about the arrival and came in from their hostels. 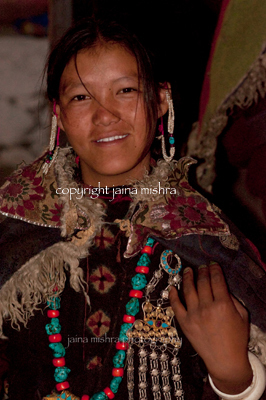 I asked about the nomads that I had seen in the valley within a km of the school. I wanted to go spend time with them and asked if they knew the families. Fortunately one of the children of that family studied at this school. So we – the lady teacher in charge, another lady and I set – out for the valley along with my driver. It was past sunset and the dusk chill had begun to set in as we walked through the grass dodging patches of yak dung and puddles left by the stream. 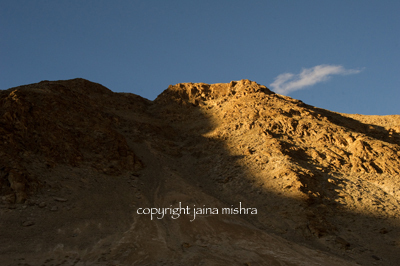 Walking in my constant breathless state, at this altitude of 14000 feet, carrying my beloved nikons and wearing heavy clothing wasn’t easy, but for this once-in-a-lifetime opportunity, I was willing to walk all night! The first two families we came across were across the stream that was about 3 feet deep – this would mean wet shoes and clothes….so we walked further hoping that as the stream curved, we would find a family on the grassland on our side of the stream. Luckily we did. As we approached, all I could see was a flock of long haired goats standing neatly in two rows with facing each other in a tight formation. I marveled at this discipline- that I thought was voluntary, until I was informed that they had been tied in this way for the night. 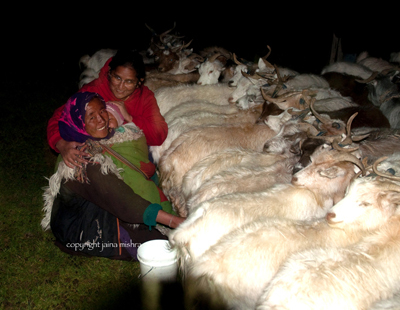 A few steps onward, I had my first sight of a nomadic scene : a lady all wrapped up in a cloak, milking the goats. We’d hardly exchanged smiles when I noticed the little bundle on her back ….a baby!! She went about her daily milking jobs with this little bundle tied to her back. She was totally comfortable with his presence on her back – almost oblivious of his being a separate entity, and he seemed totally content to be an extension of her body – a variant of the ‘baby bump’. Through all the interactions I had with the family over the next 12 hours, the baby-bump remained firmly in its place – whether the mother washed vessels in the stream or carried loads from one spot to another. 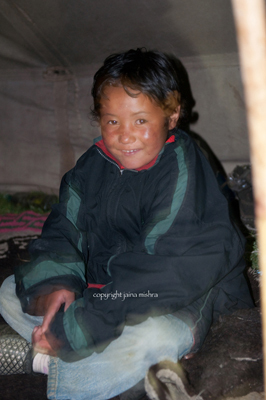 Over the week that followed I visited 2 other rural areas in Ladakh and this mother-child format was constant all across. The single and stark observation across these approximate 3 dozen toddlers that I encountered over a collective observation period of over 12 hours – is that I did not see a single episode of crying or tears or tantrums or bawling. This observation over a reasonable number of data points is so different from urban kids I encounter in buses and trains and planes or in parks and malls. My own 3 kids must never have spent 12 hours at a stretch without at least one of them shedding a few tears! 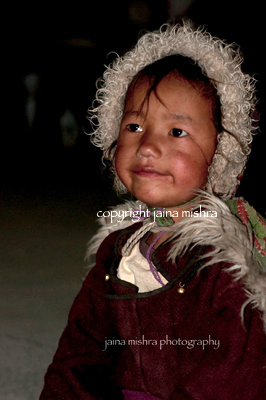 I wondered if this continuous physical bond with the mother made these nomadic children more settled. 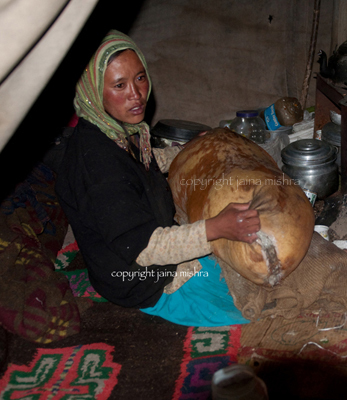 Coming back to the mother milking the long haired Pashmina goats. Once the pail was full, the second lady in the family, the wife of the second brother, collected the milk and poured some of it into a long goat skin sack called ‘Mashk’ about 4ft x 1 ft holding the narrow ends with her two hands. She held it in her lap and rolled it back and forth, back and forth repeatedly. This constant churning would result in butter floating to the top, which could then be collected and stored separately. Each batch of milk needed to be churned for at least half an hour for any butter to appear and the longer the churning, the more complete the extraction. The family tent in which the lady sat was probably all of 50 square feet in area and about my height – which isn’t much at 5 feet something. This space had to hold them AND most of their material possessions – not for a week or two but for all their lives! It shows me how my whining about living out of a suitcase on my travels is completely unjustified. 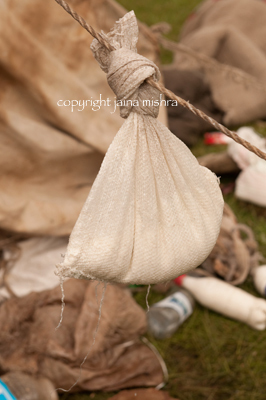 Outside the tent, hanging from one of the ropes was a large white wet pouch. It was being used to make cheese or laabo – that would be used during the harsh winter. A little fireplace at the centre held a large kettle – that probably held black tea that is had throughout the day. 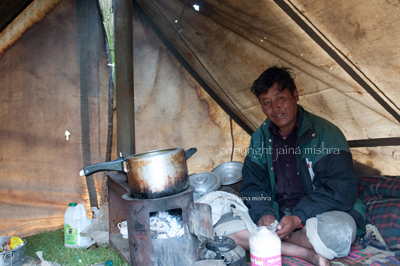 The fire had been put out for the night but the tent was extremely warm and cosy. 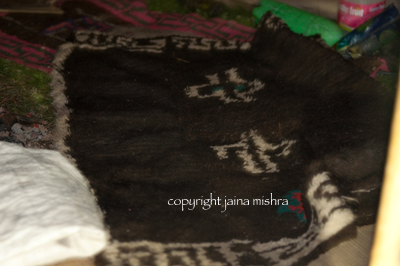 Two small gorgeous gabbeh rugs were immediately visible inside the tent – one on which the lady sat, and another on the opposite side. I need not have asked, but I did, simply to confirm whether these had been woven by the ladies themselves. And when they answered in the affirmative, I couldn’t believe that I was actually seeing a nomadic rugs being used by the nomadic family that had woven them!! This is a dream I have had since my rug collecting days – to visit a nomadic weaving tribe and see the origins of the weavings that I loved so passionately. And here I was in the very moment in which this dream was fulfilled. After years of fantasy, this thought had become a reality. It is not always easy to be aware enough to grasp that a dream is fulfilled in the moment in which it happens – usually the realization dawns after the episode is no longer a ‘current’ event – but I was fortunate to be conscious of this dream being fulfilled in the very moment in which it happened. I was thrilled and I was grateful. I hope that this experience and the delight and the discovery of a dream fulfilled will remain etched in my memory forever. 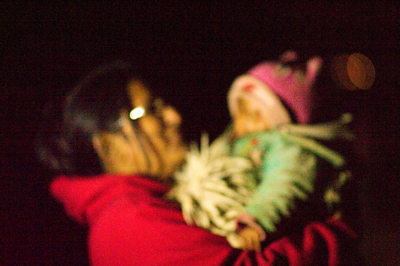 After many happy hugs and clicks, after carrying the little chubby baby nomad, we finally left as it was late and the night had completely enveloped us Back to the school to spend the night. 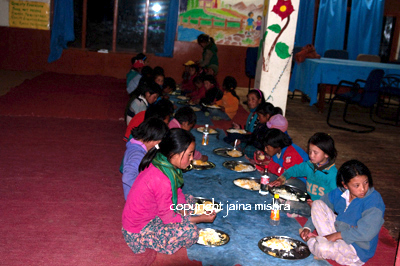 Dinner with the 110 kids – A simple meal of masoor dal and rice – Cooked by the hostel ‘mothers’. 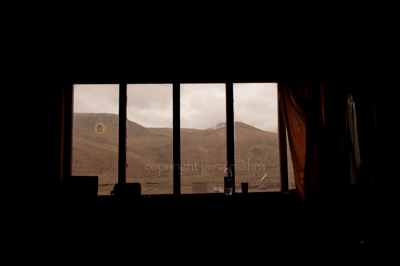 Woke up in the room with a view – the teacher’s staff room. The children bathe once a week at the hot springs nearby. There is neither the physical nor the social need to bathe more often. The environment and the circumstances dictate the lifestyle. Practices that have evolved over generations within a system are usually mutually consistent, coherent and complete within their context and solve all the problems that the inhabitants of that system face. And there is no scope for criticism or judgement from elements outside the system since these criticisms usually only address a single dimension and do not provide more than a partial and incomplete solution. 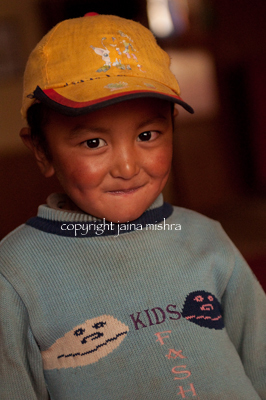 Chatted with the nomadic children about their lives over breakfast. Had some fun in their dorms and fooled around a bit with them all. Their lives have impacted me greatly and these hours spent in their presence will provide me with food for thought for a long time to come. Stopped again on the way to say good-bye to the nomadic family in the field. Today they will move into another pasture as dictated by their council. Their time here is over. A hired car will take part of the family across, while the herd of 500 goats and a few donkeys and yaks will walk across the valleys between the Himalayas. Am taking with me a little of their spirits. And leaving behind a little of my spirit. Have amassed enormous wealth on this journey! 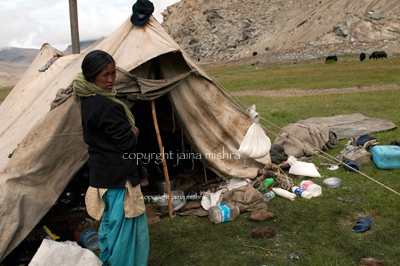 The Gallery of professional nomadic portraits will be available in October on http://www.jainamishra.com. A nomad meets the nomads! Fantastic story. I’d gotten the impression that the nomads were not very open to visitors… but maybe not? Or you just have the karisma!? 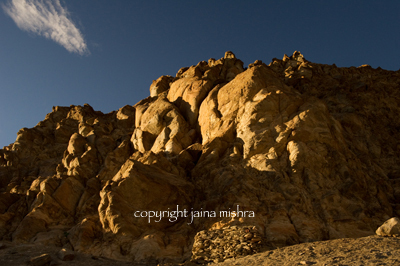 One of my best friend is from Leh, we studied together for five years and can you believe I haven’t been to Ladakh- not even once..After seeing your pictures I am very inspired to visit. 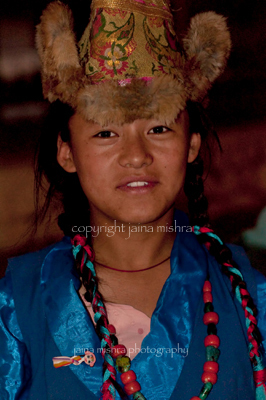 This entry was posted on September 15, 2011 by wovensouls in Culture Kaleidoscope and tagged altitude, art photography, Asia, Asian Photography, Changtang, Changthang, cultural, cultural photography, desert, Folk, Goat, herder, himalaya, Himalayan, himalayas, india, India Photography, indigenous, indigenous people, jaina mishra, journey, ladakh, Leh, Nomad, nomadic, outdoor, Pashmina, people, photo, photo essay, photographer, Photography, plateau, tent, tibet, tibetan, tradition, travel, travel photography, travelogue, Tribal Photography, tribe, weaving, wovensouls.